Welcome to our April 2016 Main Meeting. 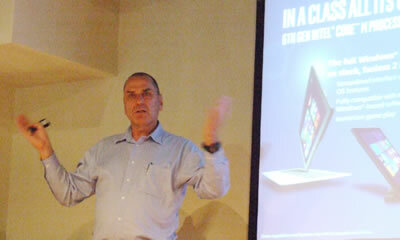 was on stage to discuss Intel’s chip technology and its future directions. One of the founders of Intel was Gordon Moore. 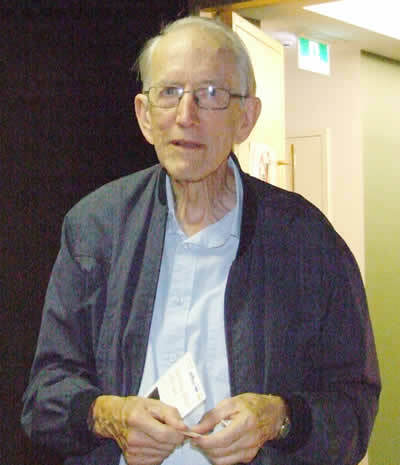 In 1965 he proposed the principle which became known as Moore’s Law. It predicted that the number of processors in a transistor would double every two years. That principle has remained true enabling long term planning in the industry, even fifty-one years later. He showed us a short video on Intel and Moore’s Law. Today Intel’s success is in Data centres where the exponential growth of processor power is fuelling the data-hungry worlds such as Facebook, Twitter and cloud storage. He compared the growth of Moore’s law to the car industry. 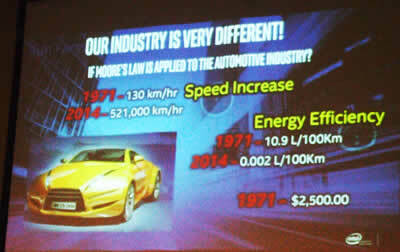 A 1971 car with a top speed of say 130 km/h, a fuel consumption of 10.9 l/100 km and cost $2500 would now have to have a top speed of 521000 km/h, a fuel consumption of .002 l/100 km and cost 5 cents. 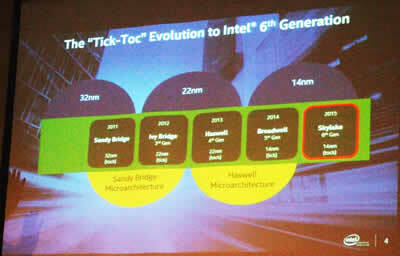 To continue this change in processing growth, Intel have a tick-toc procedure of design. There are two factors in this growth, the microprocessors technology and the micro architecture. The idea is that Intel concentrates on either the processor power, that is to shrink the transistors, or the micro architecture, that is how the processors talk to each other. As the slide indicates the tick is getting smaller processors, 32 then 22 then 14 Nano meters (nm) while the toc is building the bases on which the processors run. Here is a general overview of the idea. Graham spoke about the difficulty of design. Currently Intel can put 4000 transistors across the diameter of a human hair and getting to 14 nm really required new design ideas. The chip is designed in 3 dimensions with a process called lithography which uses light to etch the silicon wafers. To get to 14 nm Intel had to change the wave length of the light sources using ultraviolet to get such a fine etch on the wafer. That means Intel effectively has to re-tool its nine factories worldwide every time it re-designs a processor, a cost of 9 billion dollars. 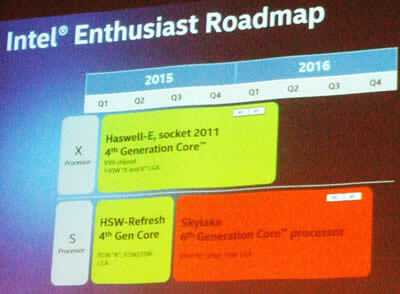 Graham compared the Intel process to that of ARM processors. ARM will develop the architecture and licence it for manufacture while Intel will handle the whole process giving them greater integration and stability in the final product. Into the future Intel will look to 10 nm and even 7 nm chips. To give us a feel for the high end development, Graham went on to discuss how Gamers have embraced the Intel enthuse program. There are 2 billon gamers worldwide and the PC is still a predominant feature in a gamer’s arsenal. Gamers will re-cycle their equipment as quickly as any developer. To cater for both developers and gamers, Intel has a number of solutions using the skylark technology. Now a gamer’s PC can have a 4Gh chip on 4 cores at 14nm, giving it both phenomenal speed and power, on top of which the overclock freaks have recorded up to 6Gh. There was a time when overclocking was frowned on but now Intel “is the King of overclocking” and have set the chip up with 1 Hz increments so virtually everything can be turned; the memory, the internal RAM, the CPU and system level settings. 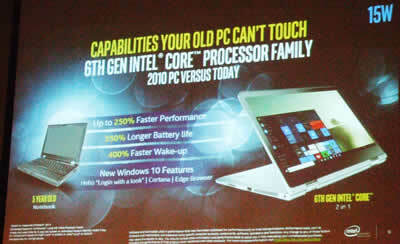 In the core M chip, that’s M for mobility, Intel can have the power of a full core i7. This means owners no longer need two machines. The core M will run the usual tablet apps, like e-mail and browsing while having the ability to run power hungry programs like CAD or architectural drawing. Graham noted how he had seen a university in Queensland undertaking CAD work on a core M processor. One of the observations that Graham made was that while the take up of tablets was huge, no one threw away their PC because they “still needed to do real work”. Graham commented that the Excel spreadsheet is Microsoft’s real power house program. Corporations can have huge spreadsheet’s and Graham has seen household sheets of over 4000 cells. 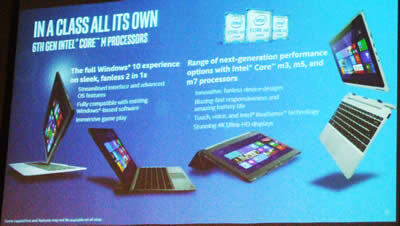 All this means people still need power and Intel have recognised this in the structure of the core M processor. However, as these PCs age they can’t match the new Intel processing power, so the trend appears to be heading towards, two in ones and large screen convertible machines. He moved on to the new USB C with Thunderbolt technology. USB C is the latest evolution of USB technology and like Apples Lighting connector is bi-directional. There is no up or down when plugging it in. Thunderbolt was originally developed by Intel as a means of connecting optical cabling and was then engineered for copper wire as well. 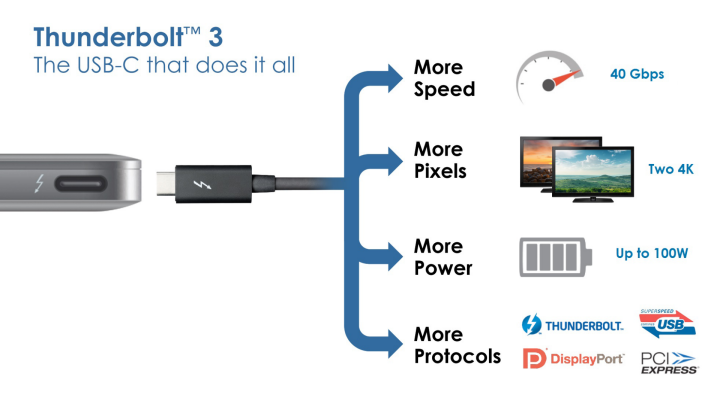 Thunderbolt 3 now delivers speeds of 40 Gbps and can connect to devices like your 4k ULED TV. A single lead delivers both high definition video and audio. To quote Graham “It has a bi-directional PCI express Bus so Gamers can now place a gaming engine on the other side of a USB C cable and get that full gaming experience”. Another interesting feature of USB C is that it can charge your machine. 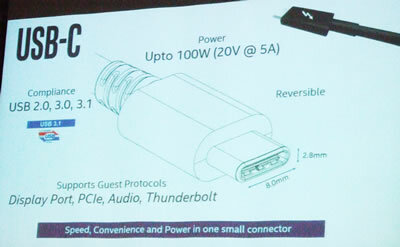 Some USB ports could charge devices from the machine but USB C port will also allow “charge in”. There may be no need for a specific power cord. 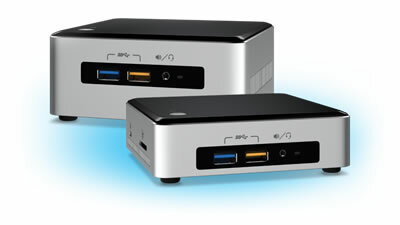 Then Graham introduced us to the NUC. NUC? For the uninitiated that’s Next Unit of Computing. It’s Intel’s brand name, minicomputer. 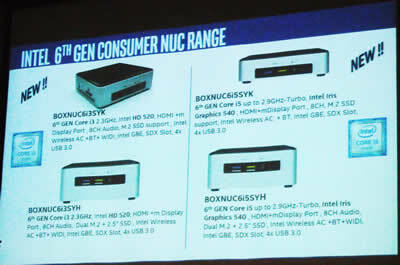 The Intel NUC has been around for a while. It’s stripped down to allow enthusiasts to customise the box to meet their needs. This sixth generation can come with all the memory, storage and connections you need. 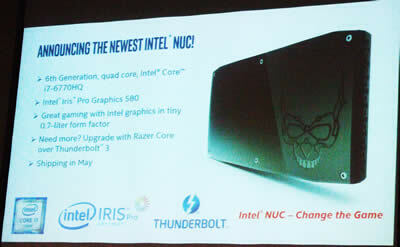 In May, Intel will introduce the “Change the Game” NUC with core i7 3D Iris graphics and of course Thunderbolt USB C.
Looking into the future, Graham spoke about the next generation of flash memory. 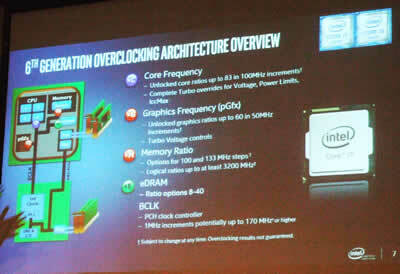 Intel are innovators of flash memory and have a new technology, 3D cross point. There are no transistors in 3D cross point, the structure is held in place chemically. 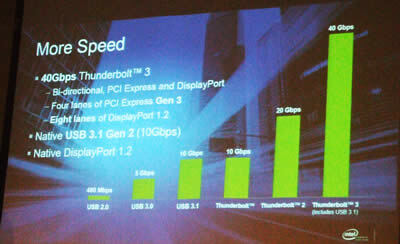 It is three thousand times faster than NAN memory which is the basis of SSD memory. This type of memory should deliver upwards of a thousand time more capacity Graham spoke of possibly delivering a 1.2 terabyte drive for the equivalent 120 gigabit drive. Cross point will be available for servers next quarter. Facebook are undertaking a trial of the cross point memory. Graham then introduced us to the Compute Stick, Intel's flash drive computer. 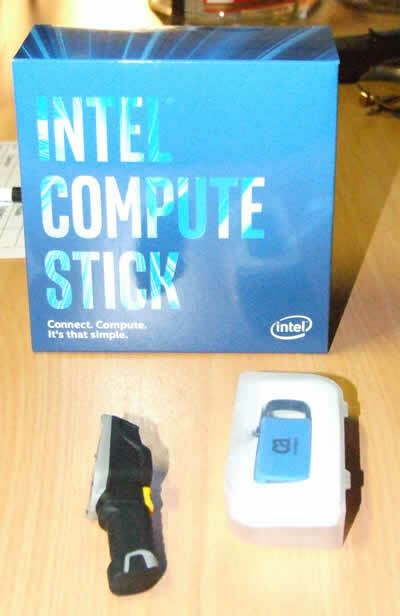 The compute stick comes in Atom or Core M processors, a minimum of 1 Gb of ram and Windows 10. 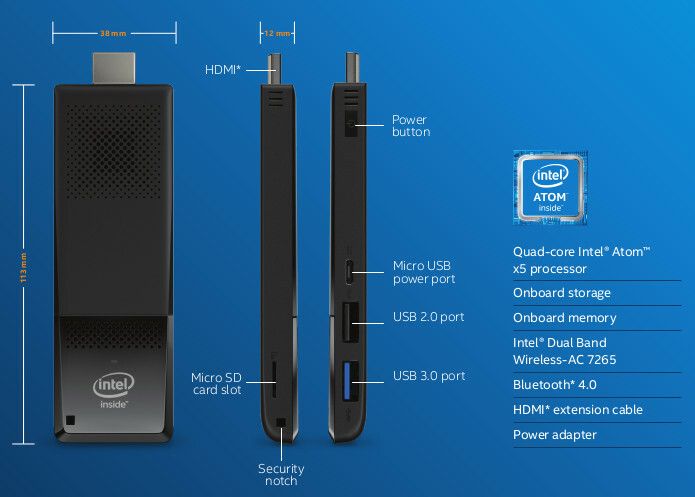 It’s a full computer with HDMI and you can plug it into your TV, Projector or desktop monitor for a full PC experience. It has Bluetooth so the keyboard and mouse can be connected. 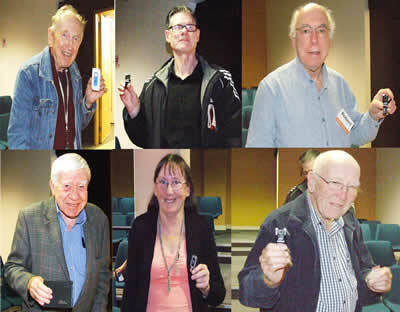 The use people are finding for this varies from entertainment to advertising displays. 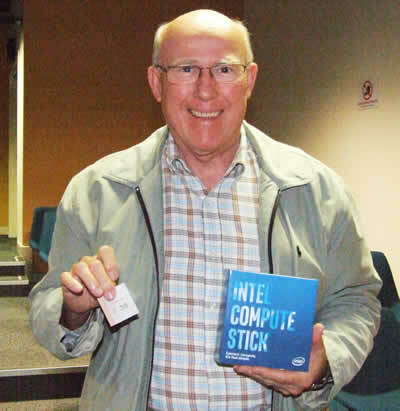 Tonight Graham offered the Intel Compute Stick and a few flash drives.